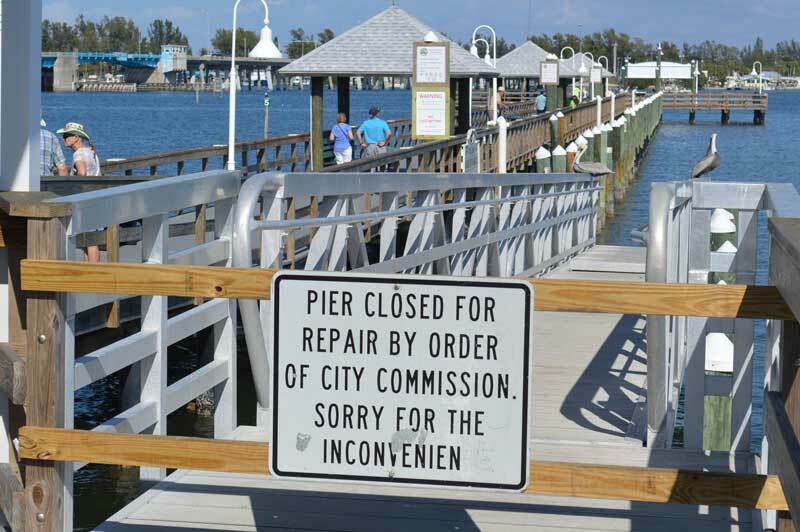 The gangplank at the Historic Bridge Street Pier in Bradenton Beach remains closed while the city awaits installation of a new floating dock. A year is a long time to tap your nails on the table. Bradenton Beach has waited more than a year for a replacement floating dock at the Historic Bridge Street Pier. Now it appears they will continue to wait until June 30. At a special community redevelopment agency meeting May 21, members of the CRA voted for member John Horne, owner of the Anna Maria Oyster Bar restaurants, including the one on the Bradenton Beach city pier, to write a letter to contractor Technomarine of West Palm Beach asking for specifics regarding shipment of the dock materials and timeline. Horne said he will be delivering the letter in person to Technomarine representatives at their West Palm Beach office. 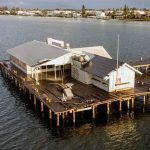 The new floating dock at the Historic Bridge Street Pier, a replacement for a storm-damaged dock, was approved by the Bradenton Beach Community Redevelopment Agency in March 2017. More than a year has passed with only permitting and planning documents provided to the city for the project by Technomarine. 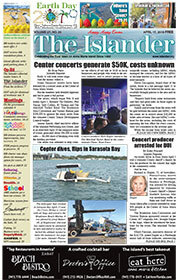 The latest schedule provided April 5 by Technomarine indicates the city can expect completion of the new dock June 29. This is the fourth schedule provided by Technomarine since the March 2017 approval. According to the most recent schedule, the deadline for permitting was May 11. Building official Steve Gilbert said May 17 he had not received the documents and the contractor did not answer follow-up emails. Initially, Technomarine representatives said work on the dock would begin in September 2017. The company received the city’s deposit of $29,995 in April 2017 and another payment of $23,996 in August 2017. At a May 17 commission meeting, Horne, whose business stands to benefit from boaters who arrive via the floating dock, said the city has waited long enough, and suggested a special CRA meeting. Mayor John Chappie agreed with Horne. During the May 21 CRA meeting, chair Ralph Cole said Technomarine committed to the June 30 deadline when it provided the new schedule, so perhaps the city should wait to initiate legal proceedings to break a contract until after that date. During public comment, Bradenton Beach resident Dan Morehaus, a contractor, suggested the CRA send a representative to Technomarine to speak with someone in person. “If we have paid for services, can’t we visit and inspect to see progress to date?” Morehaus asked. Additionally, he suggested writing a letter with specifics, including deadlines missed, the status of materials shipped from Technomarine’s manufacturers and the city’s desire to see the dock completed by the end of June. Horne volunteered to write the letter and send it to Perry to review, before sending it certified to Technomarine. He also offered to hand-deliver the letter May 24 to the company’s office in West Palm Beach. A motion for Horne to write and deliver the letter passed unanimously. 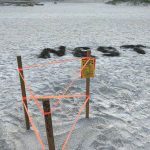 Cole said an update will be provided at the next CRA meeting at 9:30 a.m. Wednesday, June 2, at city hall, 107 Gulf Drive N.
Bradenton Beach apparently is not the only city having difficulties with contractor Technomarine. City commissioners in Pahokee, a city in South Florida, voted in late April to cancel a design-build contract with Technomarine for renovations to a marina and campground on the Lake Okeechobee waterfront and preparing its restaurant for reopening. 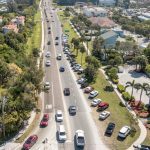 The motion also specified the Palm Beach company is required within two weeks to refund to the city $125,000 of $150,000 that Technomarine was paid to begin the work —firm representatives said they already spent $25,000 on studies and design. The city signed the contract with Technomarine in late January, with a June 30 completion deadline, which was determined by a $1.2 million grant the Legislature had approved. As of the April termination, construction on the Pahokee project had not commenced.